Can't wait for the opening day of deer season? 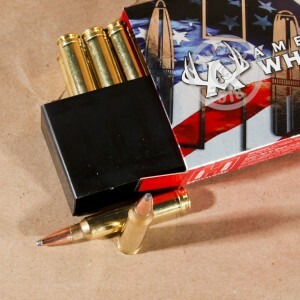 Make sure you're prepared with these 300 Winchester Magnum American Whitetail cartridges by Hornady, designed specifically for deer hunting! 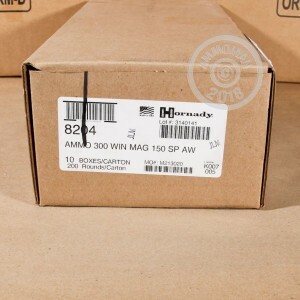 These 20 Rounds of ammunition will be delivered to you in brand new condition. 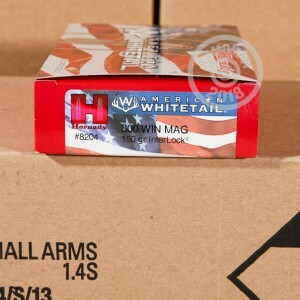 They are reloadable and have brass casing and Boxer priming. The 150 grain soft-point bullets feature Hornady's InterLock design, keeping the core and jacket locked together during expansion to retain mass and energy. You will see accuracy that is consistent and performance that is top notch with every shot. Hornady's first bullet was made in 1949. Joyce Hornady, an avid shooter, believed he could make his own bullets better than what he could buy. He was successful, thus creating a brand that would only improve with time. Today, Hornady Manufacturing continues to supply quality ammunition to customers all over the United States and throughout the world.